09 | August | 2007 | ZOMG, Candy! 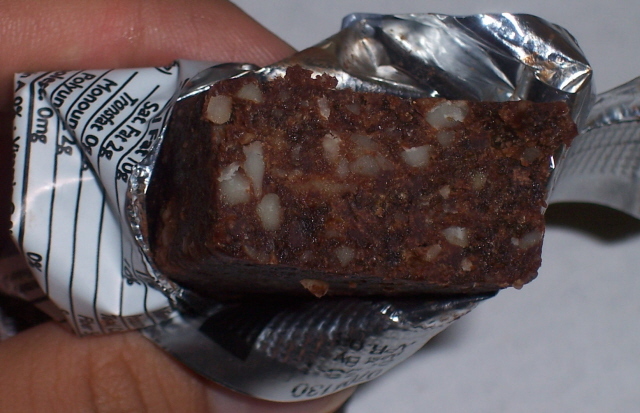 According to Larabar’s website, these bars used to be called Maya bars. They’ve replaced the cocoa nibs in Maya bars with ground cocoa beans for a smoother texture and renamed the result. The Jocalat name sounds swankier (because we’re not sure how to pronounce it), and it lets Larabar use an accent breve (it’s amazing what I still remember from my high school French classes) to create a fancier looking logo. Jocalat bars (BUY) are made with organic and fair trade certified ingredients, usually some combination of organic dates, organic nuts, organic cocoa mass, organic cocoa powder, and organic flavoring. They’re gluten free, dairy free, soy free, kosher, vegan, and with no added sugar. Unlike regular Larabars, these are made from only 90% raw ingredients because the cocoa beans must be roasted, but that’s still impressive. The bars come in chocolate, chocolate mint, chocolate orange, and chocolate coffee. As an energy bar or meal replacement bar, they’re pretty good. I personaly prefer the texture of Clif Bars to Jocalat, but I do find the Jocalat bars much more palatable than Powerbars and Odwalla bars. All four bars are softy, chewy, and studded with nuts. The texture sort of resembles that of fudge, like a stiff puree with an extremely fine grain. Chocolate – This bar is nuttier than the others, containing walnuts, almonds, and cashews in addition to dates. That’s according to the label, as I couldn’t distinguish between the different nuts as I was eating the bar. It smells deliciously of rich chocolate with a sweet and sour fruity overtone. While the Larabar website claims it to be as indulgent as a fudge brownie, I find that claim a stretch. Real fudge brownies are much better, but real fudge brownies are also full of sugar and butter and bad for you things. 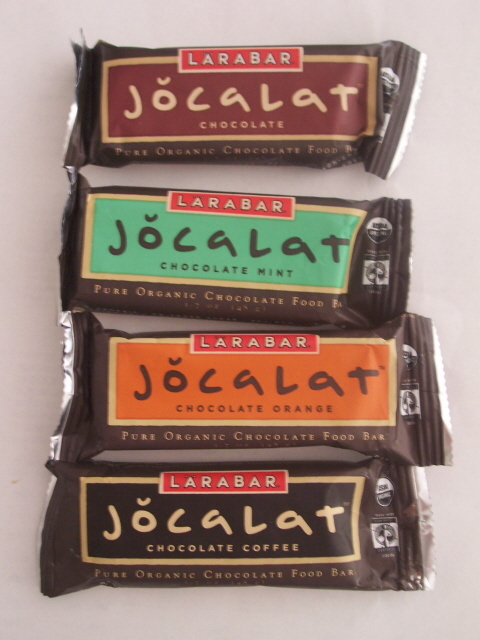 The Jocalat bars are fairly chocolate-y but not cloyingly sweet. Unfortunately, the Jocalat bar also has a bit of a sour aftertaste, possibly due to the dates. It’s not terribly unpleasant, but I could do without it. Chocolate orange – The bar contains only dates and almonds and smells of a freshly peeled orange, and the taste of orange is definitely there. The sour aftertaste is less objectionable here, I think because orange is supposed to be sour. Chocolate mint – This date and almond filled bar has a strong smell of peppermint, but it doesn’t taste as minty as it smells. The mint taste lingers a bit after the bar is swallowed, and it serves to completely hide the sour taste I found in the chocolate. Chocolate coffee – According to the website, this bar has significantly more caffeine than the others. It smells sweetly of chocolate covered espresso beans. Tastewise, however, the coffee flavor is only barely detectable as a light aftertaste. In fact, if not for the coffee smell, it find it nearly indistinguishable from the regular chocolate bar. The chocolate coffee is also sweeter than the other bars, and that slight sour taste is pretty obvious. Overall, I’m impressed that Larabar made something this tasty out of wholesome, mostly raw ingredients. I would recommend these if you’re on a vegan, raw food, gluten-free, or casein-free diet, and I know several parents of children with autism that may find these to be a valuable addition to the pantry and well worth the cost. As for me, I try to eat healthily, but I’m not health conscious to the point of spurning all processed foods. I’ll probably spend my money on deliciously bad for you candy bars instead.